Dusty Lilac Hand-Knit Vertical Knots Wool Blend Hat, "Knotted Beauty Lilac"
Carefully placed vertical knots create a stylish hat, presented by India's Himalayan Naari. 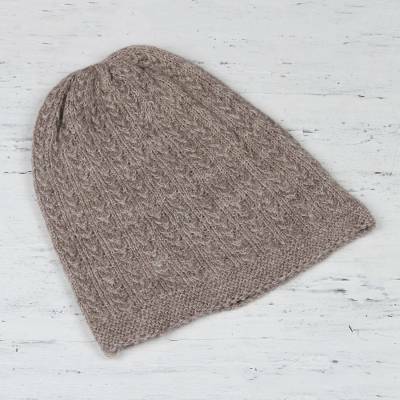 This wool blend cap is hand-knit in a gorgeous dusty lilac. The Himalayan Naari group is comprised of women artisans whose skill has been passed on from previous generations. You can find wool blend hat 'Knotted Beauty Lilac' by Himalayan Naari in accessories categories such as Wool Hats, Wool Blend Hats, Polyester Hats and Knit Hats. Enjoy exploring these sections for other Novica treasures.